It’s getting near that time when people who are lucky enough to have vegetable gardens are overrun with squash and zucchini. Sadly, I’m not one of those people. However, I recently got a bunch of these adorable crock bowls with handles and I keep trying to think of different ways to use them. 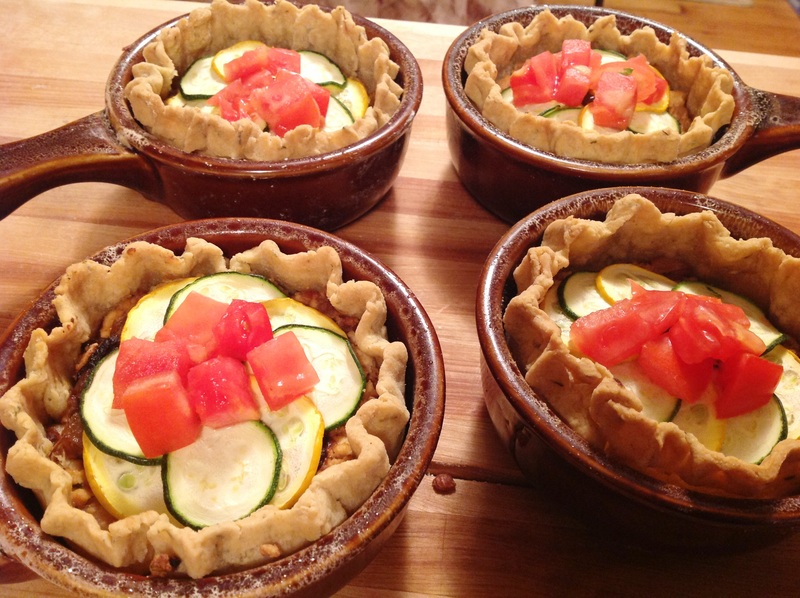 So far I’ve made Shepherd’s Pot Pies and Peach Cobblers in them and now these Summer Squash Tartlets. Usually I make food family-style which just means I throw everything in one big pot which then gets thrown into one big bowl and then thrown onto our big plates. 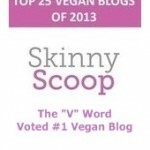 Dinner is literally thrown together…ha ha! But sometimes it’s nice to make individual servings – it’s easier to stick to a “normal” portion size, the food actually cooks a bit faster and most important (to me), it’s just so much cuter! These tartlets have a gluten-free dough which amazingly (to me) came out pretty well though I’m sure it would be prettier in others’ hands. While the dough was resting in the fridge, I made the filling. You can make whatever filling you want. I chose a tofu ricotta that I mixed with caramelized onions. You could make the ricotta with cashews or other nuts (I have a hazelnut ricotta recipe here) but honestly, ricotta made with tofu is my favorite. 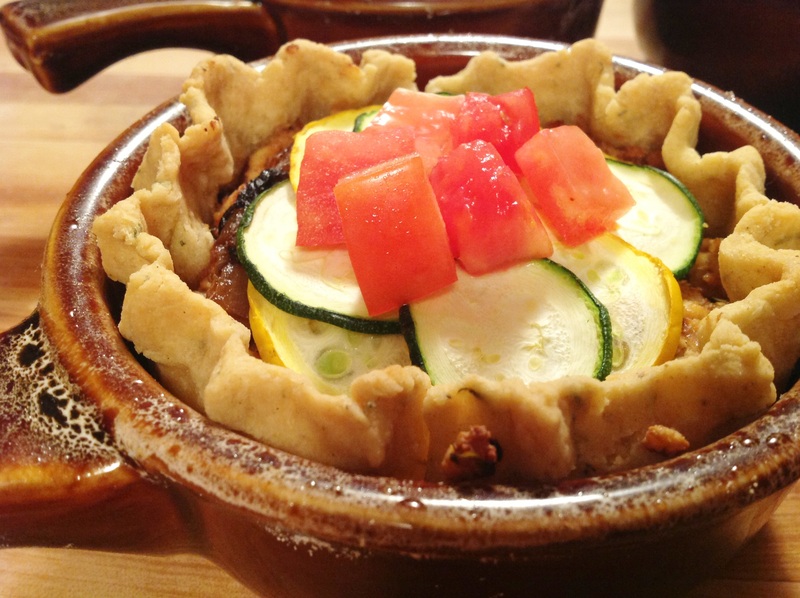 I topped the tartlet with alternating rounds of zucchini and yellow summer squash and after they were cooked, some diced tomatoes. These tartlets are so pretty, they would be wonderful for special parties or brunches, bridal showers or if you need to impress the in-laws. They taste great served hot or cold. If you need a new way to use up your zucchini and squash, this is it. 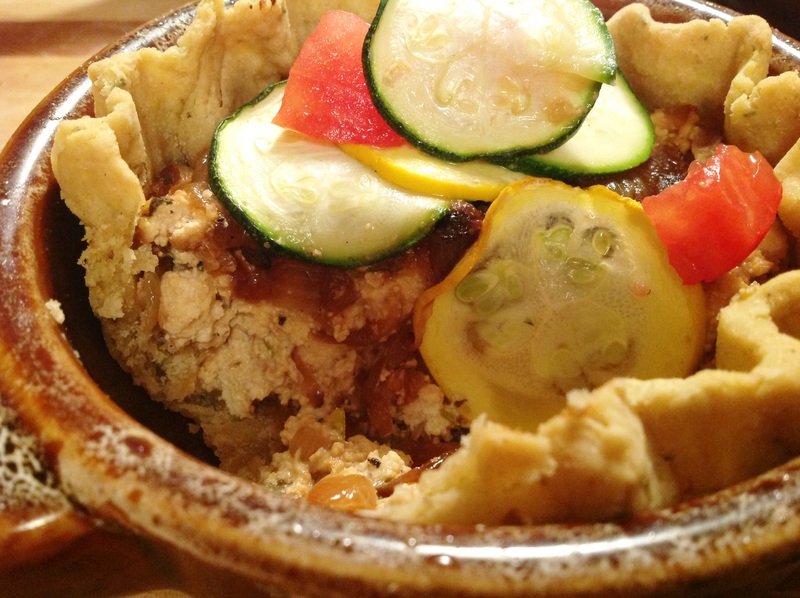 And if like me, you don’t have a vegetable garden, my Summer Squash Tartlets with Caramelized Onions and Tofu Ricotta will make it look like you do. Enjoy! To make the crust: Preheat the oven to 350 degrees. In a large bowl combine the flour, xanthan gum, salt and thyme and mix well. 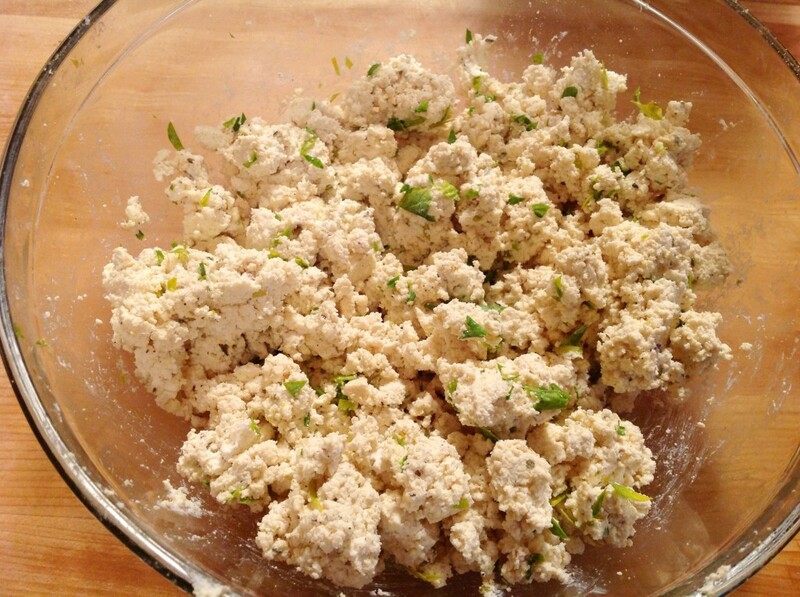 Add the vegan butter to the flour and cut using a pastry cutter or a fork until the mixture is crumbly. Add 5 Tbs. of water to the mixture and continue to cut with the pastry cutter or fork. Keep adding water, one Tbs. at a time, until the mixture forms a dough. Shape the dough into a disk, wrap in plastic wrap and refrigerate for at least 15 minutes. When the dough has chilled, unwrap it and divide it into 2 disks. Spread flour on your work surface and using a rolling pin, roll each disk until it measures about 10 inches in diameter and is very thin. 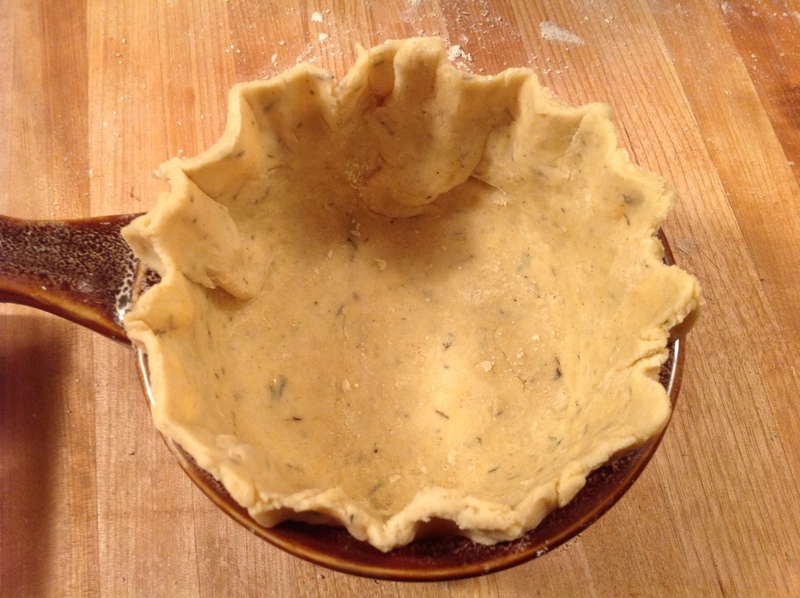 Use the ramekin or pie pan as a guide to cut the dough. Place it face down on the dough and cut a circle of dough around it with a paring knife. Make the circle about an inch larger than the ramekin. Sprinkle a bit of flour into the ramekin and put the circle of dough into it, shaping it carefully to mold it to the ramekin. 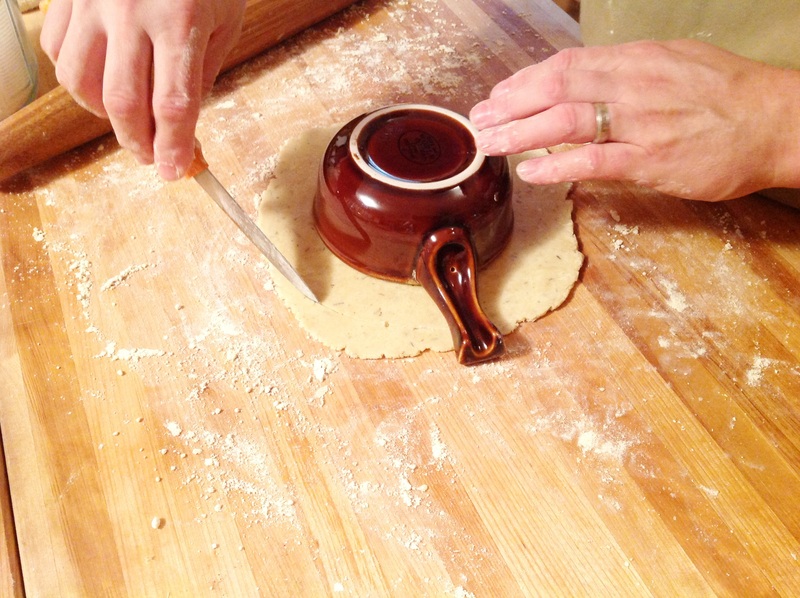 You can make pleats at the top by pinching off the dough all around the top. Spray the inside and top of the crust with cooking oil Repeat with the rest of the dough and the remaining ramekins. Place the ramekins on a baking sheet and bake for 10-15 minutes or until the crust gets browned a bit. 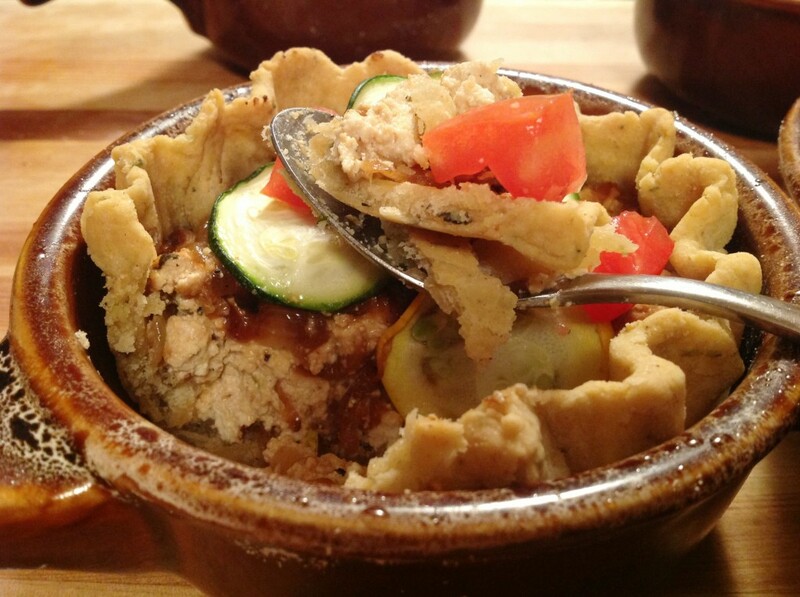 Remove the crusts from the oven and set aside until ready to fill them. To make the filling: Cut the onions into halves and then cut each half into thin slices. Heat the oil in a large skillet. Cook the onion slices over medium heat, stirring often, until they are browned and caramelized. It takes about 30 minutes to fully caramelize and shrink down. While the onions are cooking, make the ricotta. In a large bowl, crumble the tofu into pebble-sized pieces. Add the cream cheese, grated parmesan, herbs, spices and lemon juice. Mix to combine. Taste for seasoning. Set aside. Using a mandolin, slice the squash and the zucchini into paper-thin rounds. To make the tartlets: Fill each tartlet crust with a few spoons of the ricotta. Top with some caramelized onions. Lay the squash and zucchini rounds on top. I like to alternate them so it’s yellow, green, yellow, green, etc. Lay each round on top of the last one so it covers half of it until you have completed the circle. Sprinkle some salt on top and bake for 30-35 minutes until the tartlet browns a bit. Remove from the oven and let cool. Top with chopped tomatoes, salt and pepper. Serve warm or cold.